The Valley of the Riff is well inhabited and plentiful in its offerings and the beauty of its vast sprawl is that there is room for many. 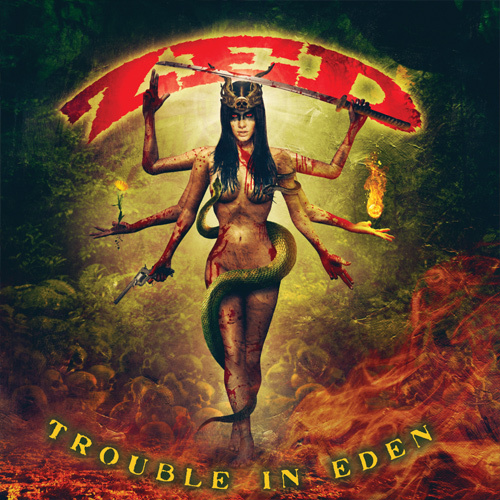 Making their presence known with heavier footprints than most however are San Jose-based earth shakers ZED, who unleash their new album Trouble In Eden this August on Ripple Music. Showing the maturity and confidence to explore the full gamut of their influences and what inspires them, blasting out onto the San Francisco Bay Area rock scene in 2007, ZED quickly made a name for themselves with their crushing live shows and incessant grooves. Having played together in various projects since ’98, including releasing an album with the band Stitch for Prosthetic/Metal Blade Records, guitar player and vocalist Peter Sattari, drummer Rich Harris and bassist Mark Aceves joined up with guitar wizard Greg Lopes to create a sound that was uniquely their own. A sound with the sole purpose to rock with no concerns for genre classifications and idle labelling. Independently releasing their follow-up album Desperation Blues in May 2013, garnering critical acclaim as well as charting on CMJ throughout the summer, ZED supported the album by playing consistently through the fall of 2014 where they began focusing on writing their follow up and debut record for Ripple Music, Trouble In Eden. Delivering a barrage of head bobbing and body-shaking blues-driven rock, you’ll find no bell-bottoms, wizard sleeves or hip huggers here. Yet showcasing equal appeal to fuzz-box mercenaries, ’74 Chevy van-driving stoners and horns-thrusting metalheads ZED’s latest effort is an honest collection of blood, sweat, and tears crafted into raw, personal tales that touch on religious-fuelled tragedy, societal reflection, struggles with mental anguish, loss and perseverance. It’s an album every fan of rock and roll should instantly relate to. A record on which you should drop the needle, press play, crank the volume and prepare to be intoxicated by the potion ZED are offering. Trouble In Eden will be officially released on 26th August through Ripple Music.